Utila | A year volunteering! Viaje a Utila y mi cumpleaños!!! The trip started on the 11th of May (which seems like months ago!) and the plan was to get a direct bus to La Ceiba, hop on the ferry to Utila and stay there until Thursday when we would come back for white water rafting adventures and the annual carnival in La Ceiba. It didn’t exactly work out like this. Firstly, we arrived at the bus station in Tegus and discovered our planned bus of 6 hours actually takes 8 hours so we would definitely be missing the ferry that day. 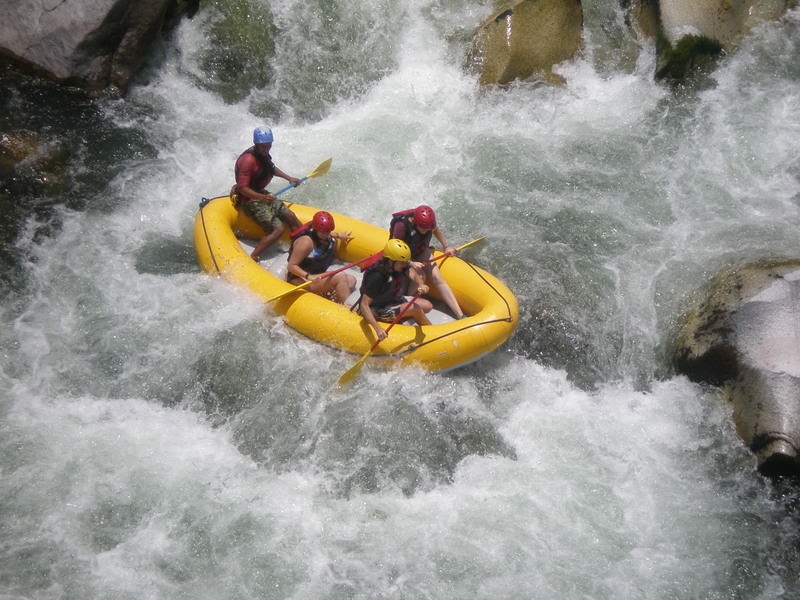 At first we just planned to find somewhere cheap to stay in La Ceiba and get the ferry the next day, however my clever brain kicked into gear and realized it would make much more sense to do the white water rafting the next day instead and then get the late ferry to Utila. This turned out to be an amazing plan change – we arrived at the lodge in the middle of Pico Bonito and quickly met a guy from Canada who was in Honduras for a couple of weeks. We quickly persuaded him to join us in white water rafting the next day and then ate a nice yummy, traditional BBQ dinner. However, while we were relaxing with some rum and coke, two Hondurans arrived – Alex and Darwin (quickly nicknamed Charles, obvs), who insisted on playing dominos and buying us a Honduran style shot named Gifiti. Here is a little description I found of it: ‘We have a special shot called “Gifiti” which is a drink from the indigenous people of Honduras called the Garifunas. It consists of 10 to 15 different types of herbs and roots from the jungle including aphrodesiac. They make it differently in different places for example some places they put rum, coca leaves, marijuana’. I cannot describe how disgusting it is; it is incredibly strong and tastes like the ground. But we managed to force some down – and now come to think of it I wouldn’t be surprised if we’d actually had the marijuana version considering what we went on to do next. What started out as a nice evening (and drunken) stroll down the river, quickly turned into a ‘let’s take our clothes off and go for a swim’ escapade! Sorry parents but it was a lot of fun, except for maybe when we tried to cross the strong river flow and Alex decided I needed help so proceeded to carry me across and… well I was a little too close to a naked stranger for my liking. It was good fun though and we also got our first idea of how the Bay Islanders speak. They speak English and Spanish on the islands (as the British were on the Islands for a long time) but it is very Jamaican and very fast. The next day we woke up bright and early for a breakfast to try and cure our hangovers from the night before. 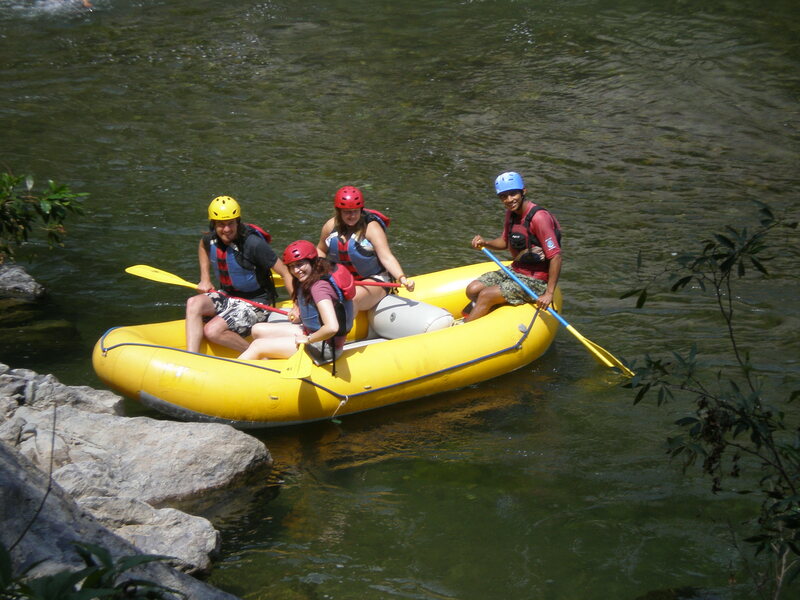 We then set off for our rafting adventure – we didn’t realise this included a river hike first. We were climbing all over huge rocks and boulders – really exhilarating but terrifying at some points. I did work myself up to do a huge jump off at one point, after a bit of encouragement and a little push from the others – but I did it! The guys somehow scaled a steep cliff so they could jump off from there. We then floated down the river back to the raft which I could have done all day, so relaxing. So by the time we got to the raft, my body was aching, my head was pounding and we hadn’t even done the actual rafting yet. It was so much fun though, the rapids and dips weren’t too big so it wasn’t too scary but a big thrill to see a drop coming and you have no idea how big the drop is going to be. And just as we got to the end, Laura managed to somehow fall out of the boat, which was quite hilarious. And it was even more hilarious watching Taylor try to pull her back into the boat (I will put pictures of this up as soon as Laura finally gets the pics on facebook). Once we had dried off a bit, we had to say our goodbyes to the lodge and Taylor and make our way to the ferry. The ferry was nowhere near as bad as Laura has been reassuring me it would be and we got there ready for a yummy pizza at Mango Inn. We also met a couple of people at your hostel, a girl from Canada called Zizzi (who we thought was in her mid 20’s but it later turned out she was a really young looking and nearly 40 years old with a 19 year old daughter) and Michael. Michael is from Kent and, as we discovered, a proper city boy. So we proceeded to make fun of him for most of the week (including making him drink a shot of Giffiti). The next day we found Chepes beach, a minute walk down from our hotel, and it is beautiful. People say there are no beaches on Utila, which granted there aren’t a lot, but the ones they do have are nothing to complain about. Especially as whenever I went to Chepes there was never more than about 10 people there, sometimes no one at all. The water was amazingly blue and clear. However, it turned out the next day that Laura may have enjoyed the sun just a little too much. She woke up the next day with an unbelievably red face, swollen lips and blisters. Apparently applying factor 20 sun cream once for a whole day in the sun in the Caribbean isn’t enough! So Laura’s first few days were ruined a bit as she had to stay in the room away from the sun and visit a crazy doctor but I was happy to stay on the chilled out balcony and bring her various supplies while she recovered. I had Zizzy and the city boy to eat with and one night we went for a swim as it was getting dark and another night we went to a little lake to watch the sunset which was beautiful. In the meantime we did hear a rumour that the carnival we had planned to go to, and were really excited for, was the weekend after we thought it was. At first it was stupidly hard to actually get confirmation, even the people who lived on Utila had no idea, but it did turn out it wasn’t until the 25th of May this year. Stupid Honduras!! So we decided to stay on Utila until we returned back to Tegus, which due to Laura being ill, turned out to be a good thing. As soon as Laura was feeling better we bought her a nice, big sun hat and went on some adventures. We hired a couple of bikes – which seemed like such a great idea, cycling around a mostly flat island and seeing more than most people do? Well we forget about the heat… and the fact that we haven’t been able to walk anywhere for 4 months. So we struggled. However, we did manage to find a deserted beach one day and a pier the next which was great to swim around. So the day after, when we would have been going to Cayos Cochinos (but it cost a stupid $200 to get there from Utila), we went on a trip to one of the Utila Cays instead. The cay is called Water Cay and there is absolutely nothing there but palm trees and white sand beaches. And compared to $200 we only paid 150L each to get there; so about 5 pounds! So I spent my birthday on a perfect beach, with a beer in hand, and the crystal clear waters of the Caribbean surrounding us. Perfect. So the next day we sadly said goodbye to Utila and got up early for the 6.20 am ferry to begin our long journey home. When I got back I went for a meal with my host family, and they got me a big birthday balloon and cake, and they sang the traditional birthday song – Hondurans sing the birthday song in English first then Spanish for some reason. So all in all, a good birthday and a great trip! There are amazing beaches, you just have to look for them. The weather – hot hot hot. I love it! How friendly everyone was – when Laura was ill, our hostel owner drove her straight to the doctor’s and made sure she got seen to quickly. Getting ripped off… As we’ve been living in Honduras for a few months now myself and Laura have a good enough idea of what prices should be so that we know when we’re being charged too much. But it’s obvious that taxis etc. like to take advantage when they can… we paid 300L (about 10 pounds) to get to the Jungle lodge (which even we thought was too much) but poor Taylor paid 600L. People being so oblivious to Honduras – someone blamed the disorganisation of their dive company on the fact that ‘we are in the 3rd world’. Hmm. And people just don’t seem to even realise Utila is part of Honduras. We also saw one of the weirdest things I have seen yet in Honduras… we were walking to the Mango Inn on our last night in search of pudding when we saw a big crowd of people ahead of us. It turns out a family were having a domestic on their front porch and all the locals were literally crowding around the house trying to get a good view of the action. They were just standing there like it was a cinema, not even trying to be subtle. So strange! *Also, I think my Dad would be impressed to know that when we were at the Water Cay we saw a huge pelican swoop down and dive into the sea and come up again with a big fish in its mouth. I wish I’d had my camera at the time but it was still pretty cool to see! Thanks for reading and thank you everyone who wished me a happy birthday!! I also received my birthday cards from my parents, sister and two grans yesterday – even though they were late thanks to the seriously slow mail, it was so touching to get them and it really made my day. Thank you so much, love you all.